LD Tom Kenny and 4Wall Light the 2018 iHeartCountry Festival by AT&T | Press Center | 4Wall Entertainment, Inc.
Austin, TX- The 2018 iHeartCountry Festival last month was a non-stop, five-hour marathon of country music featuring performances from superstar country artists like Luke Bryan, Keith Urban, Sugarland, and many more. The star-studded event featured a lighting design by Tom Kenny with a substantial lighting package provided by 4Wall Entertainment. This year's iHeartCountry Festival was held in Austin, TX at the Frank Irwin Center and was streamed live on AT&T's Twitter account for fans unable to attend. 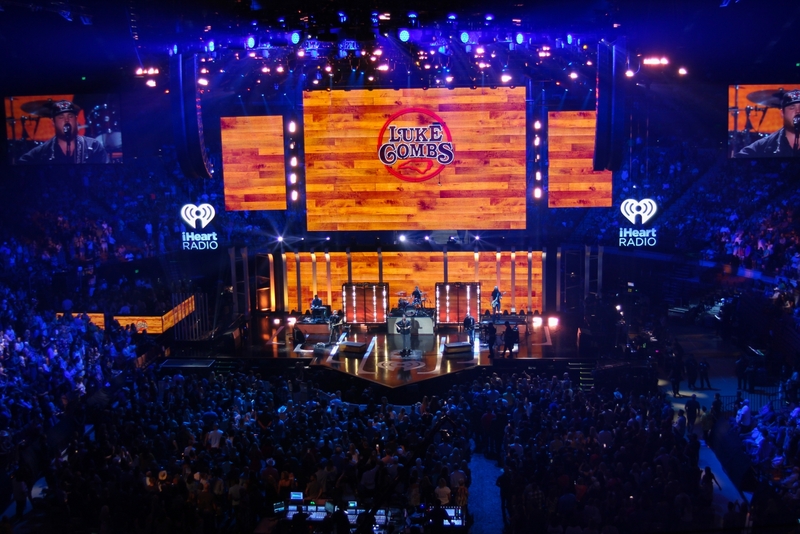 "Creating a lighting design for iHeartCountry is somewhat unique, in a sense it's more like one big television shoot, compared to the run-of-the-mill 2-day music fest," explained Kenny. "It has to be designed mostly by myself because I need to deliver immaculate, camera quality lighting that maintains fluidity between each performer." To meet the demands of Kenny's design, 4Wall put together a dynamic Robe Lighting package consisting of over 100 Robe Pointes, 62 Robe BMFL Blades, 30 BMFL WashBeams, and 30 MegaPointes. "After being shown the MegaPointe last year, I absolutely wanted them for this show," explained the LD. "The brightness and colors from the Robe gear explodes toward the crowd and creates an incredible energy that everyone feeds off of." For bright, powerful crowd hits, 4Wall provided Kenny with 24 Solaris Flare LR Q+ fixtures which had a combined output of over 1.3 million lumens. 84 of smaller Solaris Flare Q+ fixtures were also on the rig. "I've been using the Solaris Flare for quite some time now and the brightness is unmatched," said Kenny. "I've really enjoyed having the longer LR Q+ Flare be a part of my last couple of designs." Kenny was also introduced to 4Wall's latest rental addition, the Chauvet Professional MK3 Wash.
"The MK3 Wash made a great first impression," said Kenny. "This light is absolutely gorgeous and I look forward to working with it more in the future." The control system was comprised of 3 MA Lighting grandMA2 Light consoles, 2 grandMA Fader Wings, and 10 MA NPUs. There was never a dull moment at this year's iHeartCountry Festival. The show boasted surprise after surprise and Kenny painted the stage with bright colors while the 5-hour show unfolded before the fans who never seemed to take a seat. "I couldn't have pulled this off without the excellent programming work by Felix Peralta," said the LD. "His programming magic provided impactful looks that truly compliment the overall lighting design." Kenny also spoke highly of the service 4Wall provided. "Todd Mertzel and the entire 4Wall team were excellent to work with on this project. The gear and service were both outstanding," said Kenny. "Jason Uchita and Alex Flores headed my production crew and I was very grateful for their extremely hard work to load-in and out in such professional and proficient fashion." 125 - Chroma-Q Color Force II 12"